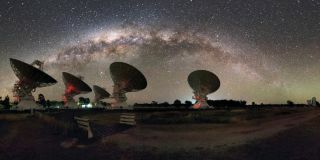 Astronomers used the CSIRO Compact Array in Australia, shown here with the Milky Way overhead, to detect strange plasma lenses shaped like noodles in the space between the stars of our galaxy. Invisible "plasma lenses" shaped like noodles, lasagna sheets or hazelnuts might lurk between stars in the Milky Way, researchers say. This finding could help solve the longstanding mystery of where a major part of the galaxy's matter is hiding, the scientists added. Previous research found that radio waves from quasars could vary wildly in strength, a phenomenon technically known as an extreme scattering event. Astronomers suggested these events were due to clouds of plasma — that is, electrically charged particles. These clouds are essentially lumps in the thin gas that fills the space between the stars in the Milky Way. "Lumps in this gas work like lenses, focusing and defocusing the radio waves, making them appear to strengthen and weaken over a period of days, weeks or months," study lead author Keith Bannister, an astronomer at the Commonwealth Scientific and Industrial Research Organization (CSIRO) in Australia, said in a statement. Previous research suggested these "plasma lenses" are huge — about 620 million miles (1 billion kilometers) wide, a distance nearly seven times the distance between Earth and the sun. Ones detected so far lie about 3,200 light-years away, nearly 800 times farther than the nearest star to Earth, Proxima Centauri. In addition, until now, scientists knew nothing about the shape of these plasma lenses. This made it difficult to figure out what these structures were or what their origins were. Now astronomers have for the first time successfully detected a lensing event while it was happening. This helped them conduct follow-up analyses that permitted the first estimates of plasma lens shapes. Researchers used the Australia Telescope Compact Array to scan about 1,000 active galactic nuclei for sudden changes in their radio waves. They detected a lensing event in 2014 that went on for a year in connection with the quasar PKS 1939-315, located in the constellation Sagittarius. Whereas old analyses of lensing events only monitored two radio frequencies, "our new method gave us 9,000 frequencies at once," Bannister told Space.com. "It was like going from black-and-white TV to color." Based on their findings, the researchers suggest this plasma lens could neither be a spherical cloud nor a corrugated or bent sheet. "We could be looking at a flat sheet, edge on," study co-author Cormac Reynolds at CSIRO said in a statement. "Or we might be looking down the barrel of a hollow cylinder like a noodle, or at a spherical [hollow] shell like a hazelnut." Detecting more of these plasma lenses could reveal their shapes, which could in turn shed light on their origins. Previous research suggested two potential origins for these plasma lenses. One involves plasma sheets, perhaps the remains of shock waves from supernovas, Bannister said. Another involves cold clouds pulled together by the force of their own gravity. If the plasma lenses are shaped like sheets, they may be plasma sheets. If they are spherical hollow shells, then they may be cold clouds held together by their own gravity. If they are hollow tubes, they may be flux tubes, structures formed by magnetic fields in the interstellar medium, Bannister said. If the plasma lenses are made up of cold clouds, that suggests that cold clouds must make up a substantial fraction of the Milky Way, Bannister said. If so, they could help solve the so-called "missing baryon problem." Normal matter is made up mostly of particles known as baryons, which include protons and neutrons found in the atoms making up planets, stars and galaxies. Normal matter only makes up about one-sixth of all matter in the universe, with the rest consisting of dark matter, a mysterious invisible substance detectable via its gravitational influence on normal matter. However, even normal matter presents a puzzle, since theories of the formation and evolution of the universe predict there should be about two times more baryons than astronomers see. Cold clouds might help solve the missing baryon problem, but "proving that is still a long way off though," Bannister said. In the future, the Australian Square Kilometre Array Pathfinder (ASKAP) should find plasma lenses "in droves," Bannister said. This may help solve the mystery of what these structures are, he noted. The scientists detailed their findings in the Jan. 22 issue of the journal Science.